With the first season of Gotham under our belts it is finally time to look back at how the series preformed. As an open Batman fan I was quite excited and overly optimistic from the moment the show had been announced. The more and more I followed the production and casting my enthusiasm grew (except for the casting of Ben McKenzie), and for a while it seemed my expectations were warranted. However about half way through the show began to split off into to many directions. Episodes began to split in unity and storylines began to feel rushed or ignored. The show never really seemed to commit to who’s stories they were trying to tell. Between Gordon, Penguin, Fish, Falcone, Maroney, ect. it was impossible to tell who the focal point was at any one time. The show is called Gotham so possibly they intentionally did not run in one particular direction, but it still felt as if many of the pieces didn’t fit together and were stand alone plot lines. There were to many of these which at times made it difficult to determine what was important or not. However it was still a fantastic season watching whether you enjoyed watching Jim Gordan climb his way up the police ladder or Penguin squirm his way to the top. Gotham has many things to fix but for a first season I am still impressed and excited for next season to return in the fall. 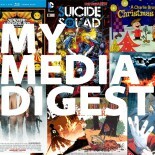 This entry was posted on May 5, 2015 by My Media Digest in Comics, Denzel Freeman, Reviews, Television and tagged aqua teen hunger force, falcone, fish, gotham, jim gordan, maroney, mooney.